Sai Priya Ayurvedic Stores (SPAS) is one of the most popular stores in the field of Ayurveda in twin cities. Established in 1994 by Mr. Hari Prasad Namburu, SPAS has achieved its popularity by providing its customers with the finest quality of Ayurvedic medicines and also by presenting the customers with various brands to choose from. 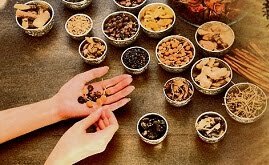 Aided with over a decade of experience & expertise in the field of Ayurveda, the staff at SPAS can suggest appropriate medicines required to treat an ailment. We are well known for our services in the market. At SPAS we sell all types of Ayurvedic Medicines. SPAS has two branches - Sai Priya Ayurvedic Store & SSM Ayurvedic Store. We have renowned ayurvedic doctors for consultation at both the branches. Please contact us for further details. Click on the Available Major brands tab For List of Major Ayurvedic Medicines available at our stores. Also, please check the Pictures/Videos under the About Us tab for more information and details of our stores. The Traditional Indian way of healing, Ayurveda, is today no longer as traditional and confined to India as it used to be earlier. Today it has become a global phenomenon and people are using the benefits of Ayurveda across the world to relieve themselves from diseases and disorders in the most traditional way and without any side effects ! The diagnosis and Ayurveda treatments would cure you of all ailments and Ayurveda herbs and Ayurveda food would help you to lead a healthy life, which will be free of diseases and disorders. Sai Priya Ayurvedic Stores (SPAS) mission is to help all people lead healthy lives. As part of our mission, we started organizing medical camps in Konijerla Village. We have two doctors in the camp to provide free consultation. Based on that we provide free medicines to the people in the village. We are educating and encouraging the people of the village to attend these medical camps. This will be a good opportunity for the low income and needy to have access to the city based Doctors / Ayurvedic Medical stores. As the number of people attending the Ayurvedic Medical camp are increasing every month, we decided to register this service as a Charitable Trust and expand this to neighboring villages across the borders of Krishna / Khammam districts. Registered Charitable Trust will bring in more Responsibility, Accountability and Dedication in servicing the low income groups and the needy. More details of the Charitable Trust can be found under the HPC Trust tab.